SA’s well-known packaging photographer and man-about-the-packaging-industry, Clive Glover, shares his top packs and the story behind them. Featured this month are Champagne Taittinger Nocturne; Graça’s celebration of its 30th anniversary; and majestic branding of Redd’s Bold Crisp. JUSTIFIABLY, champagne can claim to be the universal symbol of love, success and special occasions. Taittinger is one of the few French champagne houses still in family hands. It all began in 1934, when Pierre-Charles Taittinger acquired the Château de la Marquetterie, a castle that had symbolised French luxury for many years. Apart from this splendid castle, Taittinger is also famous for its cellars that were excavated from caves with a DNA that can be traced back to the fourth century when they were used by monks to store their champagne stocks. Located in Reims, Taittinger is now headed by Pierre-Emmanuel Taittinger, a larger-than-life CEO, who once told a journalist that champagne’s stiffest competition came not from other sparkling wines but from Viagra! 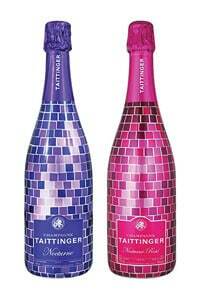 The bedazzling mosaic-patterned shrink sleeves on bottles of Champagne Taittinger’s Nocturne and Nocturne Rosé not only look spectacular on-shelf under lights at bottle stores but also make an impressive addition to any liquor cabinet. WE all remember the advent of Graça – our very own talking, eating, drinking, laughing, singing, sharing (the occasion!) wine. 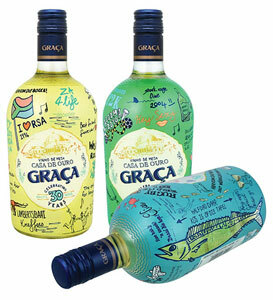 Believe it or not, last November Graça celebrated its 30th birthday by introducing three limited edition promotional shrink sleeved bottles in yellow, green and blue. Each tells the story of special times that South Africans have shared with Graça – from unforgettable events such as the 1995 Rugby World Cup and the 2010 FIFA World Cup to home-grown moments such as the Lambertsbaai Kreeffees. The 360-degree designs featured on the colourful sleeves were inspired by the ‘photo wall’ in the Paternoster Hotel’s bar, showcasing some special South African memories. Bravodesign in Cape Town came up with the concept and created the illustrations. Designer, John Nicolson, oversaw the art direction of the pack and the successful campaign. Colpak printed the shrink sleeves while Consol Glass manufactured the iconic Graça bottle in its Wadeville production facility. The shrink sleeves were applied by Consol’s decorating department at the Klippoortjie site in Wadeville and Nampak Closures supplied the screw caps. It’s South African creativity at its very best! WHILE cider may seem like the new kid on the block, it’s been around for much longer than most people realise. Hebrews drank ‘Shekar’, a brew made by combining apples with fermented juice, and in 55BC the Romans arrived in England and reportedly found Kentish villagers drinking a delicious drink made from apples. It has been recorded that the Romans, in particular their leader, Julius Caesar, wholeheartedly embraced cider as an alternative to wine, probably realising that the conquered Britons would be less likely to revolt if they had a patriotic drink to enjoy! 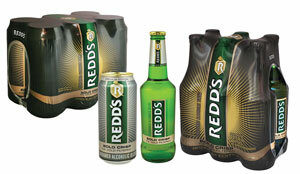 Redd’s Original was launched here in 1996 and a second variant Redd’s Dry followed in 2001. Using Berge Farrel’s striking design, Redd’s Bold Crisp was launched last year in bottles and cans. Nampak Bevcan supplies the 440ml cans, while the majestic-looking front, back and neck labels for Consol’s 330ml bottles are ex Spear. Printed on a substrate from Avery Dennison, Spear gravure prints the gold on a Cerutti press using Siegwerk inks. The six-pack material for both cans and bottles is from LR Plastics, while the matching gold crowns are supplied by Coleus. After many years in FMCG sales and marketing, and later in packaging as marketing manager of Kohler Plastics and then Kohler Flexibles, Clive formed his own packaging consulting company in 2000. He also started writing articles for various packaging magazines, and purchased his first digital camera to support his articles. Two weeks later was given his first professional photography assignment – and the rest is history. Clive is now first-choice photographer for many FMCG and packaging companies as he has the valuable knack of working digital magic in the specialised area of pack photograpy. These items are extracted from Clive Glover’s monthly column in PACKAGiNG & Print Media Magazine.